This article explores the expected performance of a MobileOne M40 short mobile helical whip for the purpose of measuring ambient noise at 7.1MHz using FSM and a communications receiver. ITU-R P.372-8 suggests that the lowest ambient noise that would be expected under reasonable propagation conditions would be the galactic noise with Noise Figure 32.4dB. This equates to a field strength of -46.3dBμV/m in 1Hz measurement bandwidth. The Antenna Factor is the ratio of field strength to receiver terminal voltage for an antenna. 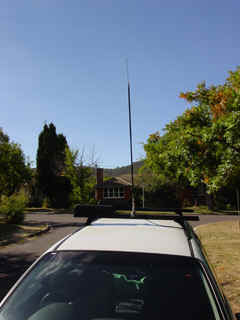 The following pictures show the antenna and roof mounting for least directivity. MobileOne M40 whip mounted on heavy duty roof bar. Detail of base and spring. The antenna has 3m of RG58C/U to the step attenuator, and a further 1m of RG58C/U to the measurement receiver. 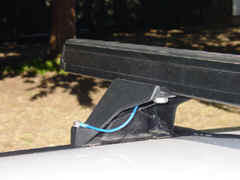 The roof bars are mounting using a reinforced plastic adapter which requires an RF bonding conductor at both ends of the roof rack bar. Using a MFJ-259B analyser to measure the impedance looking into 4m of RG58C/U, the whip was tuned for minimum VSWR at 7.1MHz. At this operating point, the base impedance of the antenna should be very close to purely resistive. The measured input impedance to the transmission line was 48+j32. Using the Transmission Line Loss Calculator, the base impedance (Zload), load end VSWR and line loss were calculated. The results are shown in Table 1. The base impedance is 25.15-j0.14 Ω (almost purely resistive as expected) and load end VSWR is 1.99. 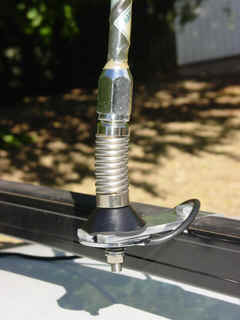 The Antenna Factor is estimated for a centre loaded whip with similar current distribution, using the online calculator. The termination loss is calculated from the load end VSWR above to be 3.5dB plus line loss of 0.23dB. The antenna with an Antenna Factor of 1.8dB/m, which will have receive performance similar to a terminated efficient antenna at this frequency of -14.0dBi gain. The field strength equivalent to a noise floor of -135dBm in a 2.250kHz wide receiver is calculated using the Field strength / receive power converter, the results are in Table 3. The system has a noise floor equivalent to a normalised field strength of -60.3dBμV/m. This is well below the expected galactic noise at -46.3dBμV/m and should not limit measurement of ambient noise.